Ads in Washington, D.C., for Fallout 3, a post-apocalyptic video game set there, have upset a few subway riders who'd rather not see images of city landmarks ravaged by war. One guys says the ads are "a daily reminder that Washington is a prime target for an attack." Of course, it is just a video game, and the entire planet looks bombed out, not just D.C. Admittedly, though, Bethesda Softworks is obviously trying to be provocative. 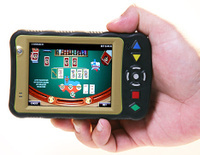 Cantor Gaming has introduced its latest mobile wireless hand-held gaming device: the eDeck. eDeck can be played in the High Limit Slot Salon at the Venetian Resort Hotel Casino in Las Vegas. You can play your choice of slots, blackjack, baccarat, video poker, and either European or American roulette. Coming soon to the eDeck selection of games will be Cantor’s proprietary games including Bonus Roulette™, XtraOdds Baccarat™ and Statjack™. According to an offer from Comcast, newcomers to the company's "Triple Play" of digital cable, VoIP service, and high-speed internet will also be able to bag a Nintendo Wii on their way out the door. Of course it comes with a two year contract but you get to walk away with a console that isn't exactly easy to find on store shelves. A sweet deal if you ask me. Press Release after jump. Yes, the Wii Fit is proving as difficult to find as a Wii console, and people are paying jacked-up prices for them. But the surprising thing is, the crappy U.S. economy may have something to do with it. The Los Angeles Times reports that Nintendo is aiming to maximize profits by shipping more units to Europe than the U.S. (2 million, vs. 500,000) to take advantage of the euro, which is kicking the U.S. dollar’s wiggly booty. They’re walking a fine line, hoping U.S. consumers won’t get frustrated trying to find the product and move on. Jonathan Mann (aka GameJew) just published a great song about the hyper-influential godfather of computer games: Pong. 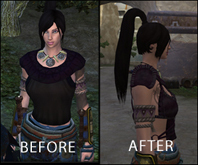 The hottest new multiplayer video game, Age of Conan: Hyborian Adventures, seems to have suffered an overnight outbreak of breast reduction. After a software patch was released to help fix gameplay issues, some players in the mildly racy (18-and-over) game noticed their ample female characters suddenly had less stack in their rack, according to Ars Technica. The image on the right is from a player who threatened to quit the pay-per-month game “if this isn't fixed in a reasonable amount of time, i.e., a day or two.” Facing an exodus of its horny-goon demographic, game publisher Funcom issued a damage-control statement saying that the change was unintentional. The company also told gamers it was “working on a fix for this, and your breasts should be back to normal soon."